Football fans can now visit partycitysweeps.com and enter the Party City Bring the Party Home Sweepstakes for a chance to win a Big Game Bash and a fully loaded Infladium customized by Sunny Anderson. The Party City Bring the Party Home Sweepstakes is offered only to legal residents of the 50 United States and the District of Columbia, who are 18 years of age or older and reside within 40 miles of a Party City Store at the time of entry. The Sweepstakes begins at 12:00:01 a.m. ET on Monday, December 10, 2018 and ends at 11:59:59 p.m. ET on Friday, January 18, 2019. Limit one entry per person per day during the entire Sweepstakes Period. 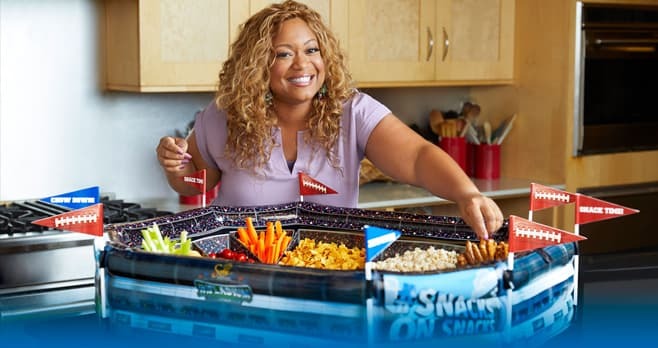 The grand prize consists of a 55” Smart TV, $150 worth of Party City supplies for decorating for the big game, and Sunny Anderson will visit your home on Saturday, February 2, 2019, to prepare football snacks for the “big game” for winner and up to four (4) guests. Visit www.partycitysweeps.com to enter and see Official Rules for details.